Apple's iPod has been easing tensions with Iraqi citizens in a real-world experiment that has seen the music player provide on-the-spot translating for a fraction the cost and size of earlier systems. Instead of carrying around a relatively bulky PDA or notebook, the U.S. Army's 10th Mountain Division has for a year been using 260 iPods and iPod nanos modified to run a special app from Vcom 3D known as Vcommunicator Mobile. The software takes advantage of the iPod's hierarchical menu system and scroll wheel to let soldiers sift through and select phrases in local dialects that match the situation at hand, such as a friendly meeting or to question a suspect. A speaker mounted on the headphone jack plays a voice sample of the sentence such that troops don't have to memorize the pronunciation themselves. Little has been done to modify the iPod hardware; other than armbands and other accessories to dustproof the iPod and its speaker, Apple's media players are the same as those that left the factory. The Dock Connector on the bottom functions the same as it does for the reference player and permits speaker docks or most any accessory supported by the Cupertino original. 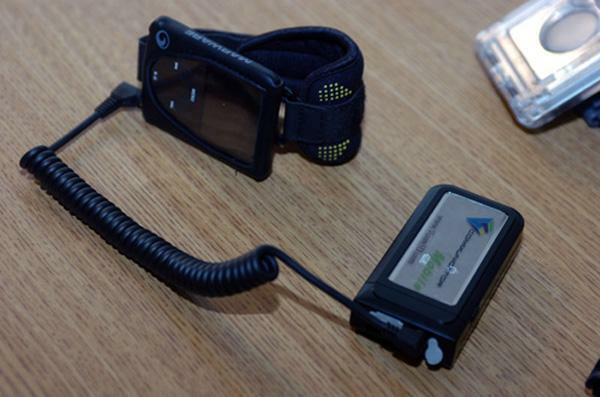 An iPod nano with Vcommunicator Mobile, armband and speaker for use in the field. | Image credits: U.S. Army. By exploiting this familiarity to its advantage, Vcom 3D not only lowered the deployment cost versus earlier methods — the complete development and equipment cost $800,000 —but is said to have reduced the learning time both for the soldiers and the Iraqis it's meant to reach. Although few American infantrymen can understand Iraqi responses without the help of a translator, the music player is not only intuitive for the Westerners but also, surprisingly, for the Iraqis who are already familiar with Apple's design. The iPod is less threatening and breaks down more of the cultural barriers the software is meant to overcome. The year-long use by the 10th Mountain Division has been successful to such a degree that the U.S. Army is looking to expand the program to include the 1st Cavalry Division. The military wing will ship trial devices with three brigades about to leave for Iraq and may use the special iPods in a broader capacity if they prove useful during the division's operations. Their abilities to play photos and videos are already talked about as potentially useful for showing maps and other visual information to Iraqi residents. Vcom 3D's wins further deepen Apple's involvement with the American military, which in recent months has grown to include native iPhone apps.